Today you save per room €35.00. This way your flight to Crete will be even cheaper! Today you save per room €33.00. This way your flight to Crete will be even cheaper! Just a few meters from the sea the Corissia Beach Hotel now offer our new comfortable apartments, these are located in one of our smaller complexes. The spacious apartments, with an area of 40 to 45 square meters, consisting of three rooms on one floor. 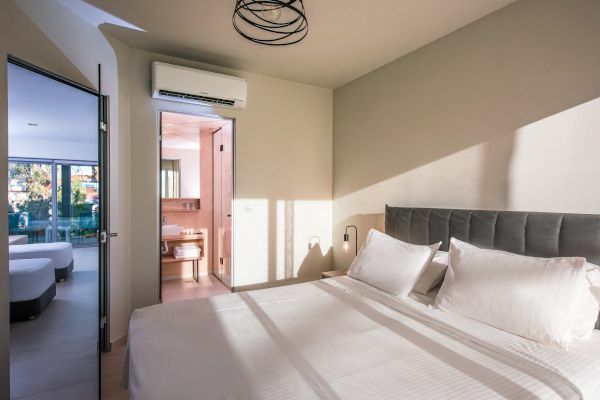 Equipped with a double bed and two single beds, a kitchenette, a modern bathroom and a large balcony / veranda, they are the ideal choice for those wanting the extra facilities and will provide an ideal choice for a comfortable and pleasant stay in Georgioupolis. The apartment also offers air conditioning, bathroom/WC with hair dryer, a small refrigerator, Tv with satellite channels, free WiFi, telephone and safe.